Priyanka Chopra knows how to rock her vacation as she wears a set of trendy dress. The Jonas family knows how to have family fun as they flew to Miami for a getaway. The newly married couple Priyanka Chopra and her husband Nick Jonas alongside the engaged pair Joe Jonas and his fiancee Sophie Turner looked all glowy and happy to be out in the Miami sun. Sister in law Danielle Jonas couldn't be spotted but her husband and the eldest among the JoBros, Kevin Jonas made sure to light up the celebration with his presence alongside the foursome. As the Jonas stepped out for a yacht ride in Florida, the Bollywood to Hollywood diva, now known as Priyanka Chopra Jonas made sure to grab all the attention on her as she looked all stylish and glamorous in a matching set of colorful striped dress. The 36 years old 'Quantico' star stunned in the setting ensemble decided to put her curves and slim physique on display as she unbuttoned most of the closure on the front of the high waisted skirt that created a high thigh slit that showed off her tanned legs as she walked with Nick hand in hand. Priyanka Chopra Jonas and Nick Jonas walk hand in hand in Miami. The stylish striped two-piece maxi dress came with a set of a cute bra styled top that featured a tiny bowknot on the front in the center as it showed off the Indian actress' cleavage. Keeping her look simple, the former Miss World World put her shoulder-length brunette layered locks free. Priyanka didn't accessorize her sundress look much either except for her diamond enormous wedding ring sported on her ring finger painted with dark nail color. To protect her eyes from the harmful UV rays, the 'Desi Girl' put on a stylish bold grey framed plastic shades as she carried an oversized two sun hats on her hand. Looking all radiant to beat the heat, Chopra stepped into a pair of dark blue slides featured with kitten heels that showcased her fresh dark matching pedicure. Husband Nick looked handsome in all green outfits from top to toe. The 26 years old singer wore a kelly green tank top jersey which showcased his muscles, a teal swim trunk he paired up with slides in matching color. 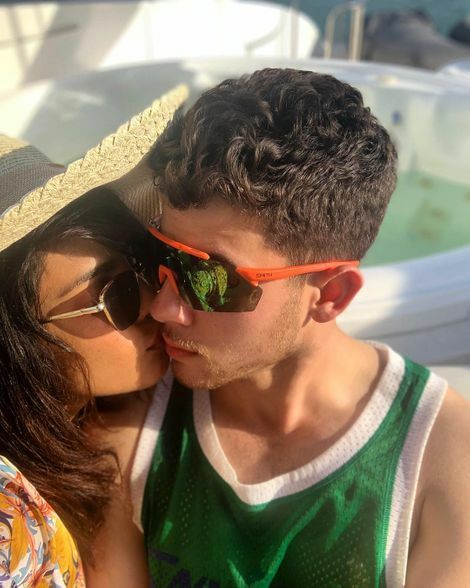 Priyanka Chopra Jonas leans in to kiss husband Nick Jonas. Both the couple took to social media to share pictures and selfies from their Florida trip for their fans. Priyanka posted a selfie that displays the actress embracing her husband with a peck, writing; 'Making hay while the sun shines..' in the caption section. As a matter of fact, the pair who tied the knot last year in December has been on their honeymoon celebration ever since. Joe Jonas and his fiancee Sophie Turner joins Priyanka and Nick on Miami. Kevin Jonas in Miami for the family trip. Likewise, Game of Thrones star Turner looked all chill in her casual style outfits that included a black graphic T-shirt, black slides, olive tights bicycle shorts, and a sun hat for protection from the sun. 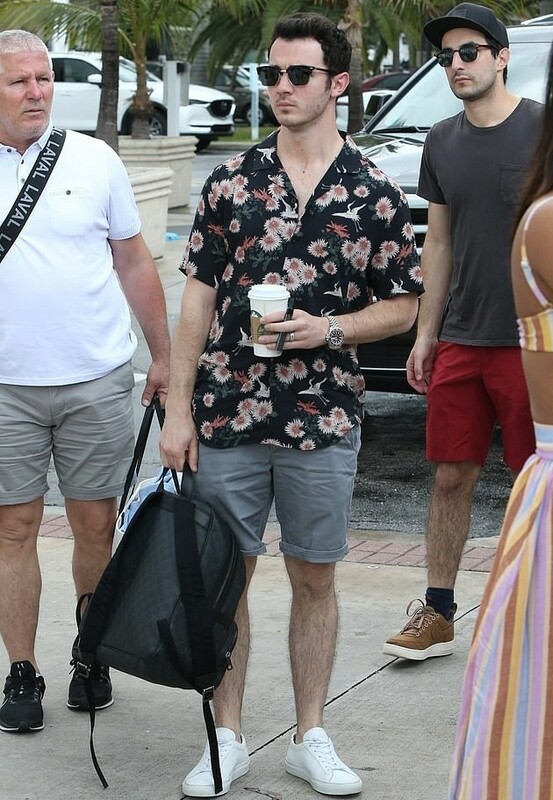 Her fiance' Joe dressed in a black and creamy printed shirt, blue shorts, and a pair of white sneakers looked all stylish and ready for the trip as well. Kevin, 31, matched her outfits with brother Joe in a similar floral printed shirt, grey shorts, and a pair of matching white sneaker.